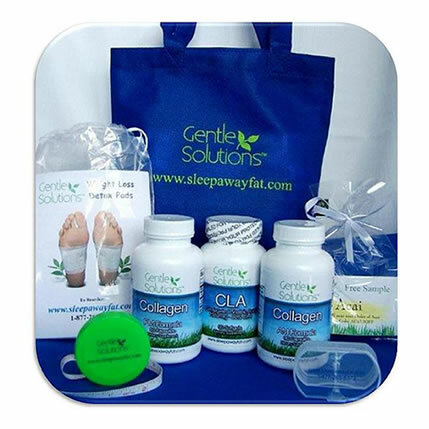 The Starter Kit includes Gentle Solutions Tummy Saver Package (Gentle Solutions Collagen AM Formula, Gentle Solutions PM Formula, and Gentle Solutions C.L.A.) This package has all the tools you will need to kick start your weight loss program. The Tummy Saver Package: is Gentle Solutions’ unique combination of the AM Formula, the PM formula, and the C.L.A. These weight loss supplements are taken together for maximum weight loss results. This package is designed to help those individuals who have excess weight to lose in the tummy area as the Collagen formula works with the C.L.A. it metabolizes and blocks carbs that cause belly fat. Weight Loss Detox Pads: are placed on the bottom of your feet during the night which will painlessly remove toxins from your body while you sleep. The Detox pads are an effective way to cleanse your body of unwanted toxins that help prepare your body for weight loss. Tape Measure: It’s important to measure yourself before you get started as most people will lose inches as well as weight, please keep in mind that some people will see the inches come off before they start seeing results on the scale. Pill Box: Don’t forget to take your Collagen or your C.L.A. It is important for your weight loss success that you take your supplements consistently as its directed. Tiny Tote: For your convenience, we are giving you a Tiny Tote to use as you wish! So happy with my results! I started the Starter kit a month ago. Tricia told me that I may only lose inches in the first month as my body starts to build the lean muscle in the first month...but I\'m thrilled to report that I\'ve lost 6 pounds the very first month! Today I\'m wearing pants that I could not pull over my thigh a month ago! Very happy!!! I\'m down 15 pounds after 3 weeks of taking The Tummy Saver Package and using my elliptical machine! I feel so much better already! I have more energy and am so very happy with my results! I\'m so excited about these products! I ordered this starter kit plus an additional Vitamin B12. I\'ve been taking the supplements daily and after just 10 days I\'ve already lost 10 pounds!! I\'m so happy with my results that I\'ve decided to order the 4 month supply. It's been four weeks and I wanted to share my results with you. I have lost 5.2 lbs but what's most exciting is that I have lost 21.5 inches over my whole body! That includes 5.5 inches just around my waist! The biggest surprise is that I really didn't change much about my life. I drink more water than i did before and i gave up soda, but that wasn't difficult. I've been watching what I eat and making smarter choices but I don't have to count calories or points. I have recommended your product to everyone that's asked me what I'm doing to look so much better. I can't wait to see my results in 4 more weeks. Thank you so much for your products. -Mellisa MO. I started with the Starter Package one Month ago, i have already lost 10 pounds & 7 total inches off my body! Thanks to this package i had the tape measure & the chart to keep track of these things, The Tummy Saver combo. really does work! I haven't even been able to excersise & i've still lost weight! I would recommend this starter package to anybody who is trying these products for the first time! I love the cute tote & the water bottle has come in handy!